Pick up time: 08:00 – 08:30 from your Reykjavík accommodation. 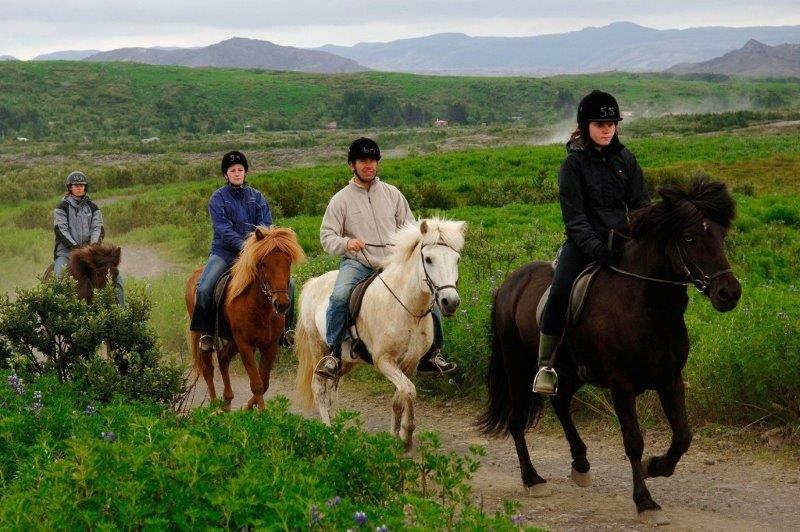 Included: Pick-up from Reykjavík, refreshments and 1,5 – 2 hours horse riding. Remember to bring: Warm outdoor clothing, headwear, gloves, swimwear and towel. This is a great tour that combines horse riding, hiking, and bathing in a natural pool. You have to be in a good physical condition and be able to mount a horse without much assistance to be able to participate in this tour. Pick up starts at 08:00 am from your Reykjavík pick up location. Please note, that the pick up can take up to 30 min. This classic hike starts from the outskirts of Hveragerði, the town of hot springs and flowers, into the beautiful geothermal valley of Reykjadalur. 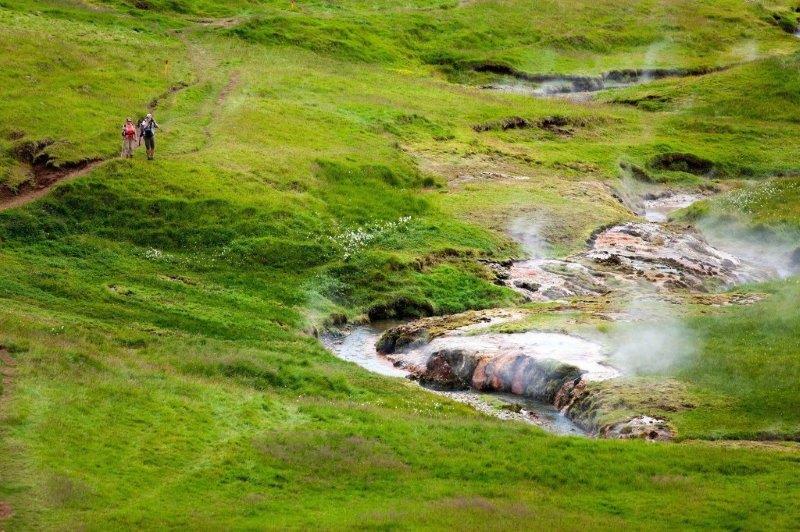 In the “Steamvalley” naturally hot water flows down of the slopes of Hellisheiði mountain range, creating the ideal place to bathe in a naturally hot river. The valley also has an amazing abundance of geothermal hot springs. You will witness everything from small gurgling melting pots to vibrant super heated pools of water. After exploring these wonders of nature, we hike back down into the town of Hveragerði. This is a great 7 km half-day trek that is suitable for anyone. It is a unique chance to visit the hot springs for a nice bathing session- just as the locals do. This trip begins through Iceland’s beautiful meadows and lava fields. Experience the unique gait tölt of the horses during your journey through the stunning and peaceful countryside. This trip includes taking you past several farms intending to give you an idea of how the agriculture and horse breeding have developed in the last few decades. 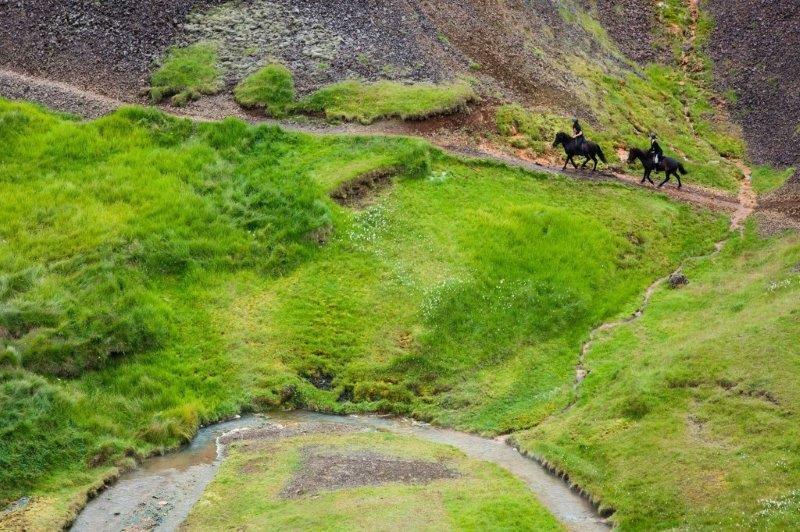 At the end of your horse riding adventure, you are invited to our old farmhouse for coffee and some authentic Icelandic home baked goods!